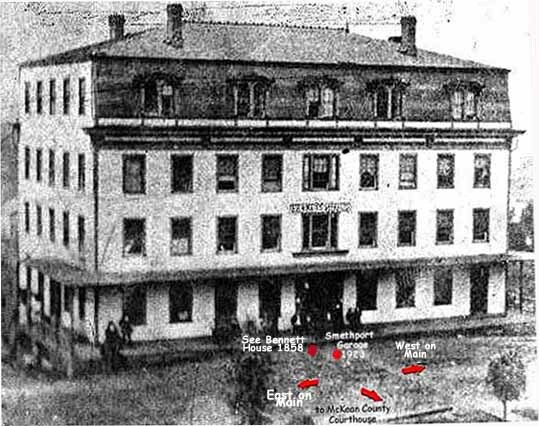 The Bennett House was a huge hotel located where the Hub and the Courtyard presently stand. It served Smethport visitors prior to the construction of the Rockwell (later the Imperial) and the Grand Central Hotels. It was destroyed in a series of two fires during 1880. We are informed by Mr. Haskill, the proprietor of the above house, that the work Of remodeling, repairing, repainting, and refurnishing the hotel is about enacted and that he will be ready to take care of any quantity of guests next week. 1 large force of carpenters, plasterers, painters, and paperhangers have been at work at the house for the last two months. Loads of elegant new furniture and carpets have been arranged in the proper positioned in the house fairly shines from top to bottom. The third floor formerly occupied by the ballroom, has been cut up into elegant rooms …. The ballroom will be on the fourth story. Mr. Haskill can now furnish rooms and beds for about 120 guests. And we do not hesitate to say that there is no other city south of Buffalo as well furnished or is well arranged for the accommodation of guests. -Jimmie Maguire spat with a painful accident while at work on the roof of the Bennett House Monday. His hand came in contact with the teeth of a saw lacerating the skin in a fearful manner. Fortunately, Jimmie had just invested in an accident insurance ticket and will get two dollars a week while he is recovering the use of his maimed hand. THE BENNETT HOUSE BADLY DAMAGED. About one o'clock Tuesday morning a fire broke out in the basement of the Bennett House, at this place, which baffled all effort at control, until a greater portion of that part of the house was badly charred, entailing a loss of from three to four thousand dollars, which is fully covered by insurance. Mr. Van Gorder, who has charge of the house for General A. Hamar, was absent at Buffalo, Mrs. Van Gorder first gave the alarm by notifying her son, who aroused the occupants of the house, of whom there were luckily but few at the time. When discovered the hallways and lower portion of the house was so filled with smoke that the greatest consternation existed among those who were compelled to make their exit. Toilets were not looked after in detail, one man appearing on the street with barely his shirt on his back. He was subsequently provided for by a friend going to his room and procuring his raiment. Three young ladies employed in the house, were rescued from the awning in front. When the alarm was given the members of the hose company were "tripping the light fantastic," at the Kittredge Opera House. An unceremonious leave was taken by all and the hose was taken out and very soon a stream of water was playing on the fire, quickly followed by a second. For an hour and a half the basement of the house was subjected to relentless drenching. During all the time, except at the start, very little blaze was noticeable, but the most intense and blinding smoke, against which it was a very difficult matter to contend. Everybody voted that the hose company did good service and but for the water supply the Bennett House must have been destroyed, with possibly other adjoining property. Everybody looked old next day. None of the boys proved timid and where all did so well it would be unjust to particularize. We have practical evidence that William Brand, Hiram Leasure, W.F. Specht and several others, actually got wet. W.P. Walsh, foreman of the hose company, proved himself ready for emergencies, notwithstanding he got shot in the eye. There was a frightful soaking and shrinkage of cloth and most of the boys got their ball clothes badly damaged, and some of them were made expressly for the occasion, too. Pity! The young ladies at the ball say their gentlemen left them without saying a word. It was very unkind. We believe there was one young man who excused himself. He said it was the "Fireman's dance" and he must go. Our people were again aroused by an alarm of fire about two o'clock last Saturday morning. The Bennett House, which had passed through the fiery ordeal but a few weeks previous, was again found to be on fire. This time, however, the flames had such headway before being discovered that all efforts to subdue them and save the building was found useless, and in an incredible short space of time the house was in ruins with all the furniture and contents. Mrs. Van Gorder and her daughter Hattie were the only inmates of the house at the time of the fire. They occupied the room on the second floor in the southeast corner and were not appraised of the peril they were in until the fire had gained great headway. They barely escaped with the clothing on their backs. The house was being repaired from the result of the former fire and was not open to guests. Mr. Van Gorder and son and other daughter were absent at Bradford. Notwithstanding the Smethport Hose Company No. 1 battled faithfully and well against the scorching heat and flying sparks the dry goods store of William Haskill's also took fire, and in a very short time was also reduced to ashes. Mr. Haskill succeeded in removing a large amount of goods. His stock was very large as he had the day before received his new spring and summer stock. Henry Hamlin's banking office and Sterrett & Rose's law office, upstairs in the building, also went with the general destruction, including considerable value furniture, though the most valuable papers, books, etc., were preserved in fair condition in the respective safes. For a time it was feared it was feared that John C. Backus's building, on the east side of the hotel, would take fire, but by faithful work by the hose company, this was prevented. The wind was from the north-east which increased the danger to the Haskill building and prevented its being saved. Sparks were carried to great distances and the roof of Mr. Haskill's dwelling, two hundred yards away, took fire, as did also the barn of Hon. B. D. Hamlin, and other buildings in the vicinity and it required great watchfulness to prevent further destruction of property. The origin of the fire is unknown. It seems to have started on the second floor. The prevailing theory seems to exist that it was incendiary, but there is no very plausible grounds to support it, that we can see. William Haskill has moved his stock into J. C. Backus's building, where it is now being inventoried. As soon as he has accomplished this task he will resume business. It is quite probable that the ground occupied by the burned building will be built up the present summer. General A. Hamar, Bennett House and contents, $25,000; insurance $10,000. William Haskill, building and contents, $10,000; insurance $10,000. Henry Hamlin, office furniture, etc., $1,000; no insurance. Sterrett & Rose, office furniture, etc., $1,000; fully insured. George Van Gorder, furniture, etc., in Bennett House, $800; no insurance. Frank Andrews, box carpenter tools in Bennett House, $100. There were also a number of smaller losses.